Have you ever read and loved a book and then seen the movie and said What did they do to my book? Dumping the best parts, they just sped through the concept, the themes, the nuances with a lot of noise and zippity do dah and ruined the quality, the character, the style, the thoughts within the story. Well, we got a true-to-the-book winner! 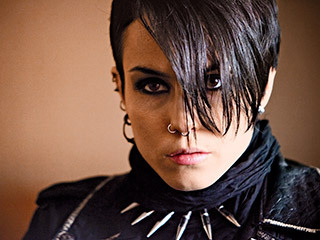 Did any of you read The Girl with the Dragon Tattoo? It’s a tremendous, suspense-filled tale with great characters and the added spice of being set in Sweden—a place we don’t usually read about. I was kind of afraid to see the new film just arrived from Sweden, fearing they’d wreck what I remembered as a great stay-up-till-three-AM read. Fear not, dear friends. It’s fabulous! Not only true to every aspect of the book, it’s quite stunning visually as it takes you out to the barren, cold points of land and water in the story and unfolds this detective-clues and the shocking things that happen there. The images and dialogue, with subtitles, take you through the seat-clutching dramas within the story, giving you not much breathing room. The characters- so well developed! The acting—so on target! Like Clark Gable as Rhett Butler, they’re really how I imagined them. So go for it! And if you haven’t read the book- try that first so you can leap ahead in the movie wondering “How will they do this?” “What will they do about that?” and see how they well they handle it all. Great night at the movies!